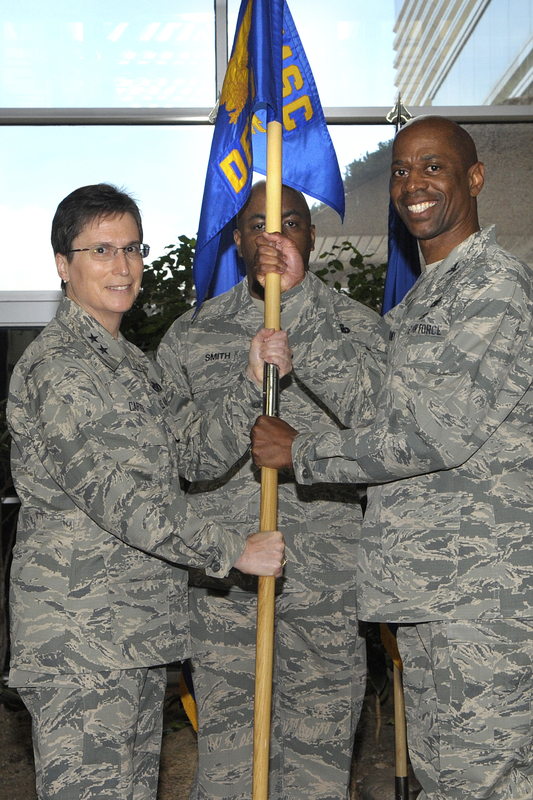 May 13, 2015 – Air Force Installation and Mission Support Center activated Detachment 1 at Air Force Space Command in a ceremony at Peterson Air Force Base on May 12. Maj. Gen. Theresa Carter, AFIMSC commander, presided over the ceremony as Col. Nathan Mooney assumed command of the newly established detachment. AFIMSC was created as part of an Air Force plan to create efficiencies by realigning organizations at Headquarters Air Force, major commands, numbered air forces and field operating agencies. “Continuity and change are really important and I think Space Command really embodies those two elements. You can’t take a day off in Space Command. It doesn’t happen, so your constant 24/7 mission certainly embodies that continuity. The mission never sleeps,” Carter said. Detachment 1 will be responsible for providing support and coordination of Air Force Space Command-specific installation and mission support requirements and priorities. “I am especially proud of the opportunity to serve as the commander of Detachment One and to lead this exceptional team… as we take the Air Force’s newest transformation initiative from concept to reality,” Mooney added. AFIMSC Detachment 1 will be located on Peterson AFB. It will be comprised of 13 military and 12 civilian positions from the civil engineering, security forces, communications, finance, and logistics career fields. “Detachment 1 will serve as the conduit between AFIMSC, AFSPC, and AFSPC-assigned units. A tremendous amount of teamwork has taken place to make this transition to a world-class Installation and Mission Support Center possible. We’re eager to build upon this initial success to ensure our wings are well supported in the future,” said Scott Anderson, Director of Logistics, Installations and Mission Support at AFSPC. The activation of AFIMSC helps the Air Force meet a Department of Defense mandate to reduce management staff levels by at least 20 percent and make the best use of limited resources to manage and operate its installations.